We love a good breakfast burrito, but we also love its equally delicious sibling, the breakfast taco! This recipe deserves a spot in your regular rotation. In a large microwave-safe mug sprayed with nonstick spray, microwave onion until soft, about 1 minute. Add egg whites/substitute and seasonings. Microwave for 1 minute. Stir in black beans, and microwave for 30 seconds, or until egg is set. Stir in cheese. Microwave tortillas on a microwave-safe plate for 10 seconds, or until warm. 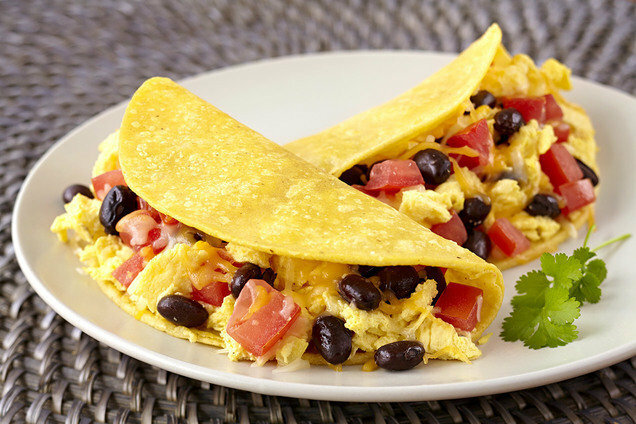 Evenly divide egg mixture between the centers of the tortillas. Top with tomato, and fold ’em up. Hungry for More Hot 'n Healthy Breakfasts? Today is America Recycles Day, November 15th. With all the pumpkin recipes you’ll be making this season, don't forget to recycle those cans! Don't leave your pals stranded without a good breakfast -- click "Send to a Friend" now!